Limited Time FREE Offer has expired, sorry! We still do offer 90% Discount, however. Download THREE Complete Books in One Zipped Boxed Set! Learn how others made mistakes, achieved successes and how they overcame challenges when implementing a BPM solution. Download the bundle of THREE complete books for the price of ONE. You do not have to enter the awards to get this great price! Part of the amazing benefits you receive as an Award Winner include publication in this annual Excellence in Practice series. To help you understand what makes a winning entry, we have created a special bundle of THREE recent books featuring the cream of previous winners. Knowing what your BPM success will look like before you even begin your journey will help you achieve it. So will knowing what are the most common causes of failure. We learn more from failure than success, but it’s easier, cheaper and quicker to learn from others’ mistakes rather than go through the pain personally. The companies whose case studies are featured in this book have proven excellence in their creative and successful deployment of advanced business process management concepts. 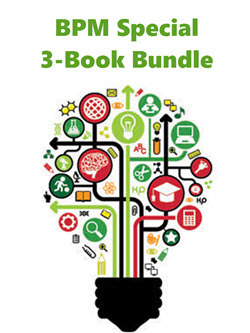 Pay only $39.95 for THREE complete books. You do not have to enter the BPM Awards to get this great price! What are the BPM Awards? Don’t be left out. We encourage you to submit a brief abstract (free, quick and easy) and get helpful feedback from the review committee on how to make a good entry even better. BPM vendors/technology providers may nominate their customers and user organizations may nominate themselves. Note: Pure product descriptions by vendors and service providers are not eligible, however, we encourage vendors to assist their customers in submitting an application describing a successful implementation of their product. Any service provider may submit a nomination on behalf of a product user or other organization. By helping the entire industry continue to evolve and mature and for users to learn from each other through outstanding examples of BPM excellence and best practices. The hundreds of companies whose award-winning case studies have been featured in our books over the past 20 years have proven excellence in their creative and successful deployment of advanced workflow and business process management concepts. The customer, service provider and their respective teams achieved significant recognition both internally and globally. So to help you understand what makes a winning entry, we have created a special bundle of THREE recent publications featuring the cream of previous submissions. Submit here a short abstract (free, quick and easy) - we'll give you fast feedback on how to make a good entry even better. Do it now!